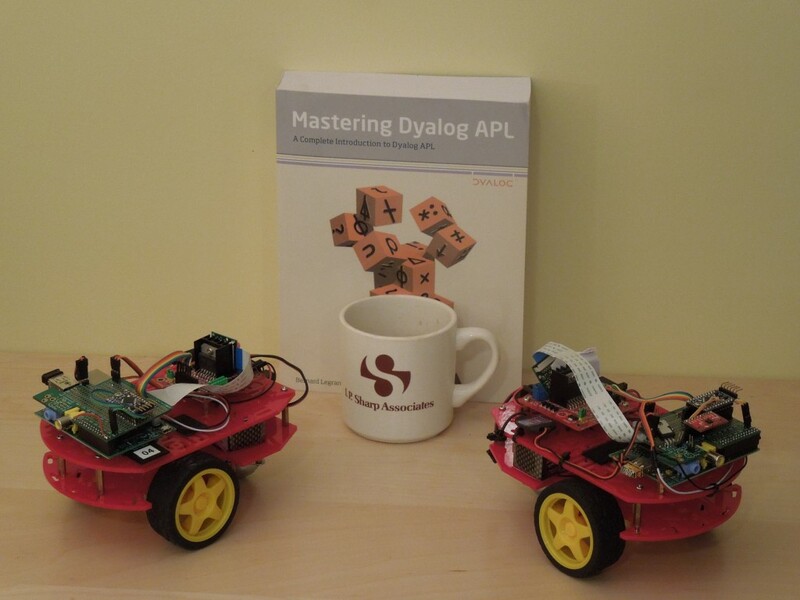 This blog originally started when I took delivery of the DyaBot, a Raspberry Pi and Arduino based variant of the C3Pi running Dyalog v13.2. The architecture of the ‘bot and instructions for building your own inexpensive robot can all be found in blog entries from April to July of last year. The downside of only using inexpensive components is that some of them are not very precise. The worst problem we face is that the amount of wheel movement generated by the application of a particular power level varies from one motor to the next, and indeed from moment to moment. 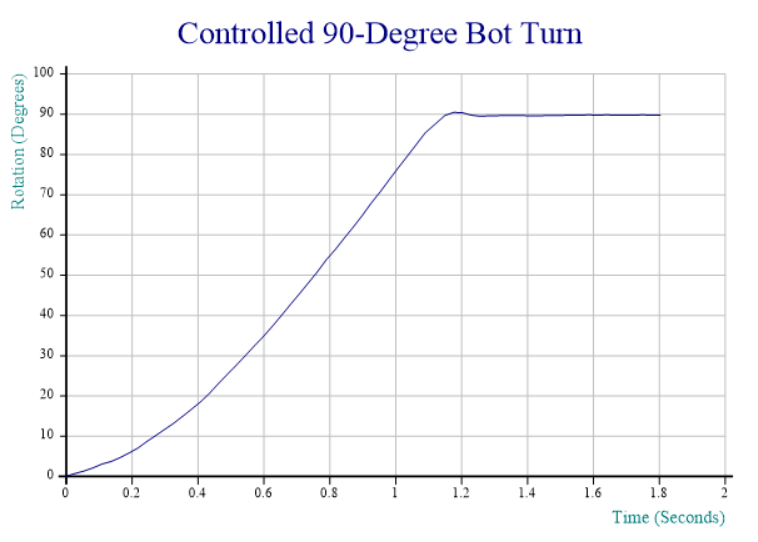 Trying to drive a specific distance in a straight line, or make an exact 90 degree turn regardless of the surface that the ‘bot is standing on, are impossible tasks with the original Dyabot. You can have a lot of fun, as I hope the early posts demonstrate, but we have higher ambitions! Even with the primitive integration and rotation strategies, the results already look quite promising. I’ll be taking most of this week off – part of it without access to the internet(! ), but once I am back, expect the next blog entry to explore writing functions that accelerate and slow down in a more controlled fashion as well as stop at the right spot rather than relying on a specific amount of friction to rotate through the last 7 degrees (note the very slight reverse rotation at the end, probably caused by the Persian carpet being a bit “springy”). I will also clean up the code and post the complete solution on GitHub – and perhaps even look at some better integration techniques. If you would like to make sure you don’t miss the next installment, follow the RSS feed or Dyalog on Twitter. The ‘bots are both running the same DyaBot class as last year. This class exposes a property called Speed, which is a 2-element vector representing the speed of the right and left wheels respectively. Valid values range from +100 (full speed ahead) to -100 (full reverse). The annotations displayed at the top left show the settings used for each step of the dance. 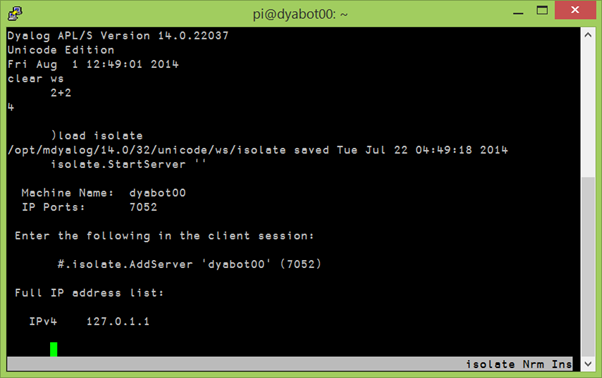 Starting an isolate server on DyaBot00 using PuTTY. Now we are ready to roll: Call the run function with a suitable array and watch the robots dance (see the video at the top)! Join us again next week to hear what happened when Romilly came to Bramley to help wire up the accelerometer and gyro! It is now 3 weeks since we shipped Dyalog version 14.0 and released the new Dyalog web site, so it’s probably time to stop celebrating and get back to work. The ‘bot batteries have been recharged and the ‘bots are learning to work as a team using v14.0 futures and isolates. That’s all I can say at this time as the ‘bots are rehearsing for a gig at the J Conference on Friday 25th July and I have been sworn to secrecy until after the show. Bot 04 and Bot 00 hanging out in Rochester NY rehearsing for the J Conference and considering whether to return to Toronto with me for the IPSA 50th reunion on October 4th this year. The next major step in the robot project is to make use of the tiny red board attached to Bot 00 (on the right) – an MPU-6050 accelerometer. At the Dyalog Seminar in New York last Thursday I finally had the pleasure of meeting @alexcweiner in person, and we vowed to crack this nut together; since @romillyc has promised to join in as well, failure is not an option. Stay tuned to hear more about that adventure in the weeks to come! It has been more than a month since my last blog post, and you’d be forgiven for thinking that I’d lost interest in robots. It *is* true that I have been rather distracted by customers, including a trip to the USA. It is also holiday season, and I have been to a music festival. However, except for last week when I was skipper and this week when I am chillng out on the Anna Elise, the robot has been in my suitcase on every trip, and I have actually been working hard on it. I just haven’t been able to get anything new to work until very recently. The BIG reason for the lack of visible progress is that I decided that the time had come to rewrite the control program for the Arduino. The robot uses a Raspberry Pi running Dyalog APL as the main “brain”, but because a high-level language on a Pi isn’t a “real time” programming environment, we are using an Arduino to control the I/O pins. The idea is that, by implementing a very simple “front-end processor” on the Arduino, we will have a tool that APL can control at a high level, leaving timing-dependent work like controlling pulse-width-modulated output pins, which need to be continuously updated, to the Arduino. The old control program had a number of limitations; most importantly, it was only really possible to monitor a single input pin. 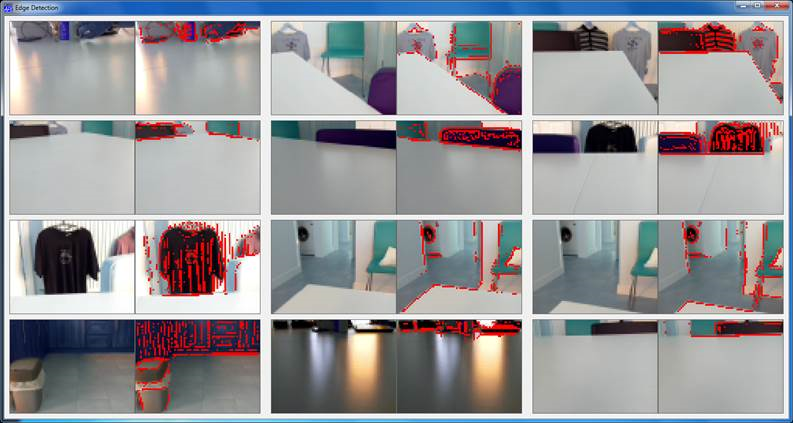 This was good enough until the sonar was added to the infra-red sensor. The program also contained hard-coded information about how pins were being used. Finally, it was quite simply a badly-written piece of Arduino C, subject to intermittent timing-related glitches because the original authors were unaware of certain limitations of the Arduino. So I decided to write about 5 pages of new C code, and it took me a month and a bit to get back to blogging. Apart from the distraction of having to pretend to still be the CTO of Dyalog Ltd, the real problem is that I am not (usually) a C programmer. C is a rather unforgiving language. Or rather, it is a VERY forgiving language – it allows you to write code that will compile without warnings but just not work, because you unwittingly asked it to do odd things like truncate the content of a variable that you have used in a context which assumes a shorter type (etc, etc, and etc). To stack the odds further against me, the default Arduino environment has no real debugger. In addition, the I2C bus that we are using to communicate between the Pi and the Arduino is very timing-dependent, which means that any attempt to step through the code will necessarily cause it to fail. Even the standard Arduino practice of monitoring diagnostic messages written to the serial interface cannot be used as it alters the timing enough to cause many I2C requests to fail. So after 2-3 weeks of wailing and gnashing teeth, I implemented my own simple logging mechanism to return diagnostic info via I2C and finally managed to move very slowly forward and complete the new control program. And I even RTFM and a few web pages written by people who had done this kind of thing before – in particular, this post by Wayne Truchsess was extremely helpful. 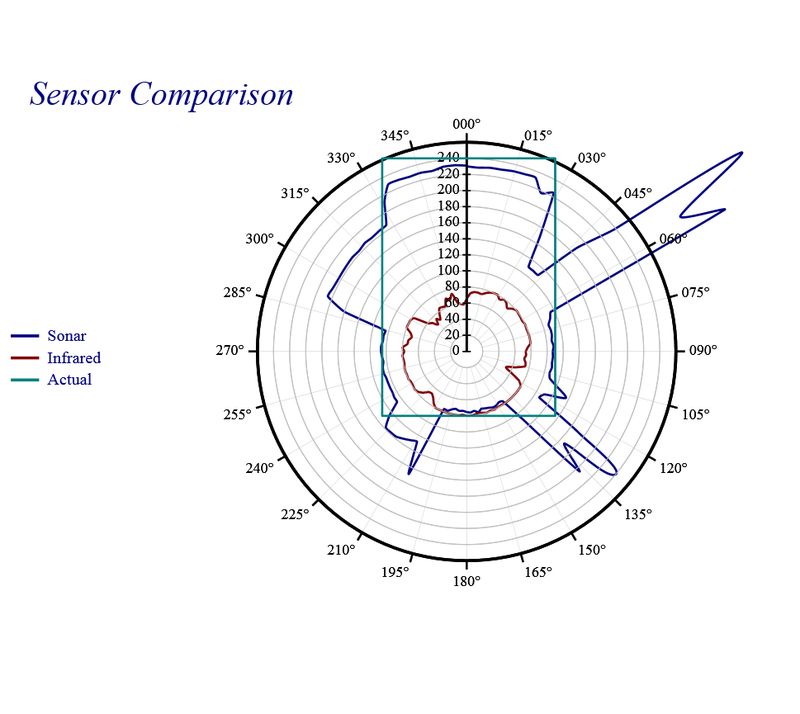 I was hoping to be able to publish some results of using the new Sonar, but I tried to do this on a jet-lagged Sunday morning sandwiched between returning from the USA and heading off to sail, and absolutely everything I did went wrong. The batteries died in the middle of my data collection and, to make the day perfect, when I found a new set of batteries, a wheel fell off (see the video above)…so I won’t be able to blog about the sonar data until I am back from the sailing trip at the end of July. However, I would like to talk a bit about the new control program. As previously mentioned, we have a piece or Arduino C code (available on GitHub), which supports a simple command language which APL on the Raspberry Pi uses to issue instructions to set or read I/O pin values. The BIG difference compared to the old version is that ALL code that either reads or sets pin values has been moved to the loop() function, which (if my understanding is correct) is dispatched by the Arduino “operating system” when the O/S is not busy with other tasks. The old program would read and update pins immediately upon receipt of I2C messages. The I2C bus is quite critical with respect to timing, and the old code was spending too much time reading pin values when a data request arrived – so we were missing the timing window for getting a response back in time – and possibly interfering with other timing-dependent activities on the Arduino. The new program constantly maintains arrays containing the latest input values (done in the “loop” function), so all an I2C read request needs to do is to transmit the current values. I Identify Returns two bytes containing the major and minor version number of the ArdCom program (currently 0 2), followed by two bytes per defined pin (pin #, pin type). R Reset Clears all pin definitions. 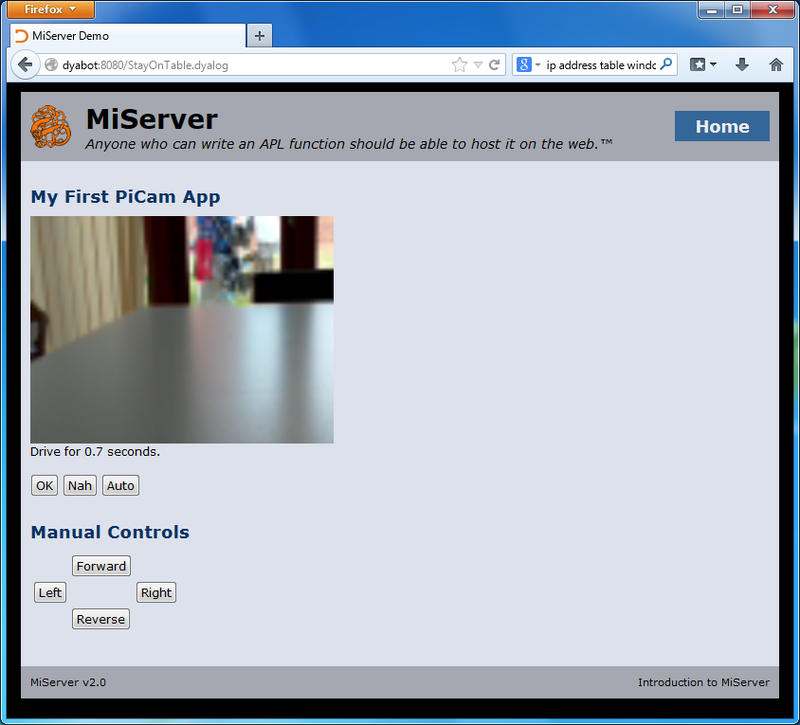 S Setup Declares pin types. Following the command character, triplets of (pin#, pin type, additional info) for each pin (see the pin type table below for details). “S” can be called several times in succession if the overall length of the command would otherwise exceed 32 bytes). W Write Sets pin values: the command char is followed by pairs of (pin#, value). Each pin declaration included in a setup command consists of a triplet of bytes, containing the pin#, type character, and “additional info”. Only the “p” pin type currently makes use of the additional info – for other pin types this value is ignored. A Analogue output Uses the analogWrite function to set the value. D Digital output Uses digitalWrite. S Servo output Uses Servo.write to update the pin value. a Analogue input Uses analogRead. d Digital input Uses digitalRead. p Pulse input Uses pulseIn to read a pulse-width modulated input. If “additional info” is set, then this should be a digital pin number which is given a 10ms HIGH signal to tell the device to provide an input pulse. See the Arduino Reference for descriptions of analogWrite, digitalWrite and the other functions mentioned above. When an I2C read request is made (by APL on the Pi), the current values for all pins defined as inputs (in ascending order) are returned in a single transmission. The data stream contains two bytes (Most Significant Byte followed by LSB) for each input pin. If the control program wants to return diagnostic information, then the first data byte will have the value 254 and the rest of the transmission will be textual “log” data. 254 is an impossible value for the MSB of any input, because the maximum input value is 1023, which has an MSB value of 3. 254 was chosen rather than 255, which frequently occurs when there are transmission failures or other errors. A new APL class has been written to communicate with the new Arduino code. You can find the source code in the file ArdCom.dyalog in the GitHub repository. The DyaBot class has been updated to make use of the ArdCom encapsulation, the new version can be found in the Exampes folder in the repository. 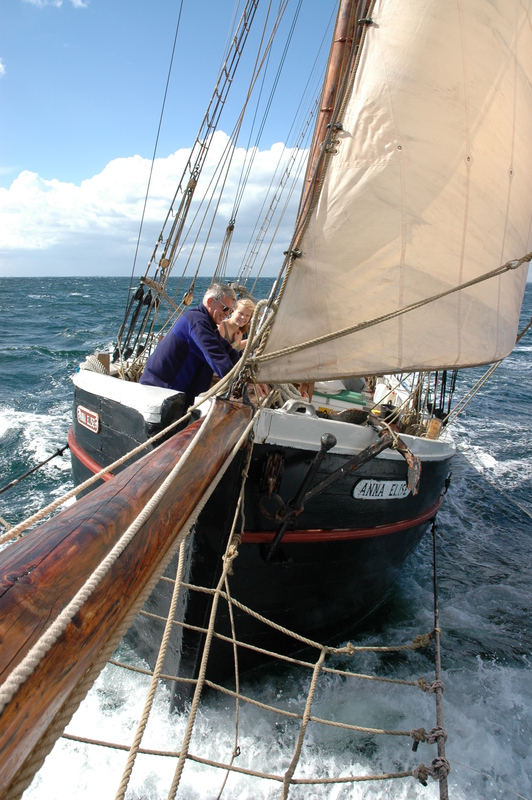 I will describe the in detail in my next blog post – probably not for another week, as the weather forecast looks superb for the next few days (probable route Faaborg-Aabenraa-Augustenborg-Gråsten-Flensburg-Sønderborg-Ærøskøbing).